Bellevue, Washington — January 3, 2018 — T-Mobile (NASDAQ: TMUS) is schooling the competition … again! The Un-carrier scored top marks in customer satisfaction – ALL YEAR LONG in 2017, according to two major independent studies. 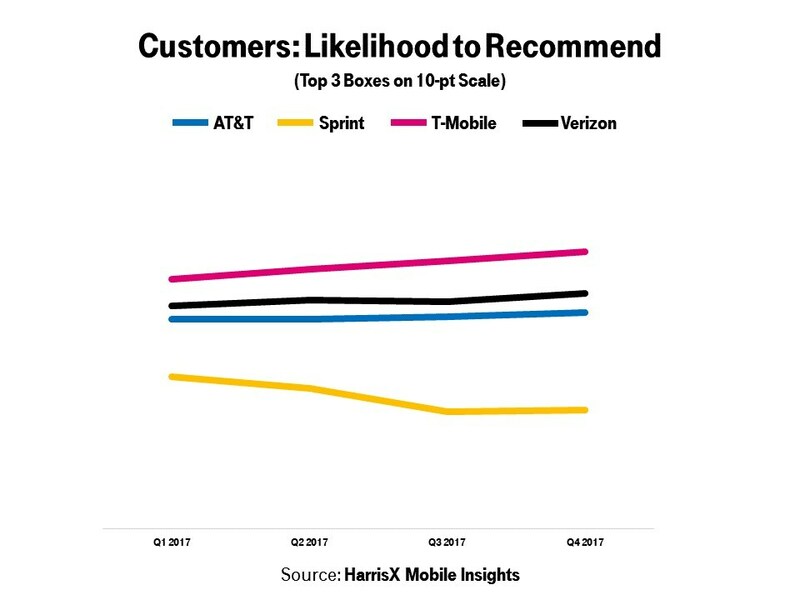 T-Mobile consistently ranked #1 in Overall Customer Satisfaction and Likelihood to Recommend1 in 2017 according to the latest national survey from the leading consumer opinion tracker, which surveys more than 360,000 mobile phone customers annually. 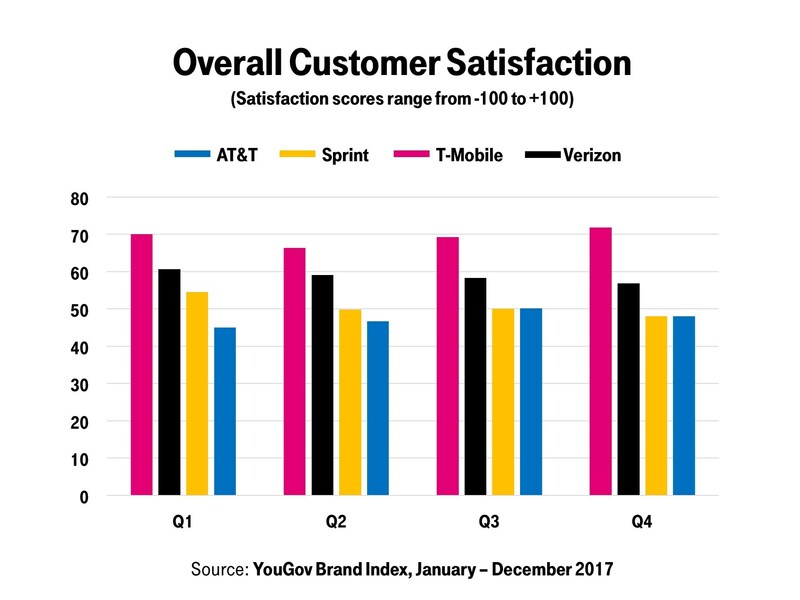 And, if one source isn’t enough for ya, the leading global polling and research firm YouGov BrandIndex just reported that T-Mobile customers were consistently more satisfied than carrier customers throughout 2017. And, it’s no wonder. The news comes as T-Mobile announced today that the Un-carrier has significantly expanded its LTE network to cover 322 million people, up from 315 last year, bringing coverage to entirely new places. In fact, T-Mobile has lit up its new 600 MHz spectrum at breakneck speed, and it’s already live in 586 cities and towns. In 2018, T-Mobile will launch more than a dozen new 600 MHz capable smartphones, ranging from budget-friendly phones to superphones. T-Mobile surpassed its aggressive commitment to reach 321 million people with LTE in 2017. The Un-carrier has nearly tripled its LTE coverage since 2015 and now covers 99% as many people as Verizon. In addition to broad coverage, T-Mobile’s LTE network consistently delivers the fastest actual customer download and upload speeds in the industry, with speeds only continuing to increase. In fact, T-Mobile’s LTE network just ranked fastest for the 16th quarter in a row – four straight years –according to Speedtest by Ookla. T-Mobile expanded its LTE network in 2017 by completing several major 700 MHz deployments and aggressively deploying its newly acquired 600 MHz spectrum. T-Mobile completed in just six months a task that is typically a two-year process from spectrum auction close to customer availability, and continues to roll out 600 MHz LTE coverage at a record-setting pace. 600 MHz spectrum will expand T-Mobile’s LTE footprint even further while laying the foundation for the country’s first nationwide 5G network. T-Mobile owns a staggering 31 MHz on average of 600 MHz spectrum licenses that can cover every single American with low-band spectrum, which travels twice as far and is four times better in buildings than mid-band spectrum. T-Mobile also closed on its agreement to purchase the remaining interest of Iowa Wireless from Aureon on January 2. 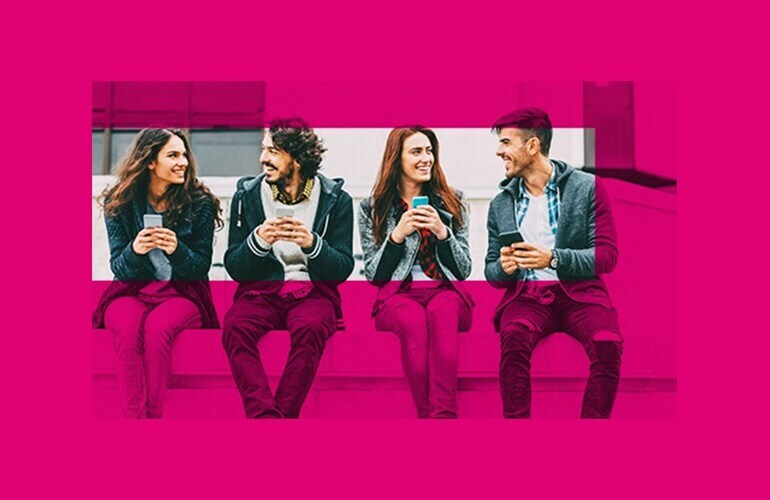 This agreement enables T-Mobile to further broaden its LTE footprint in Iowa and western Illinois and will eventually give Iowa Wireless customers access to Un-carrier benefits and America’s Best Unlimited Network. To learn more about T-Mobile’s network, please visit T-Mobile.com/coverage. 1. 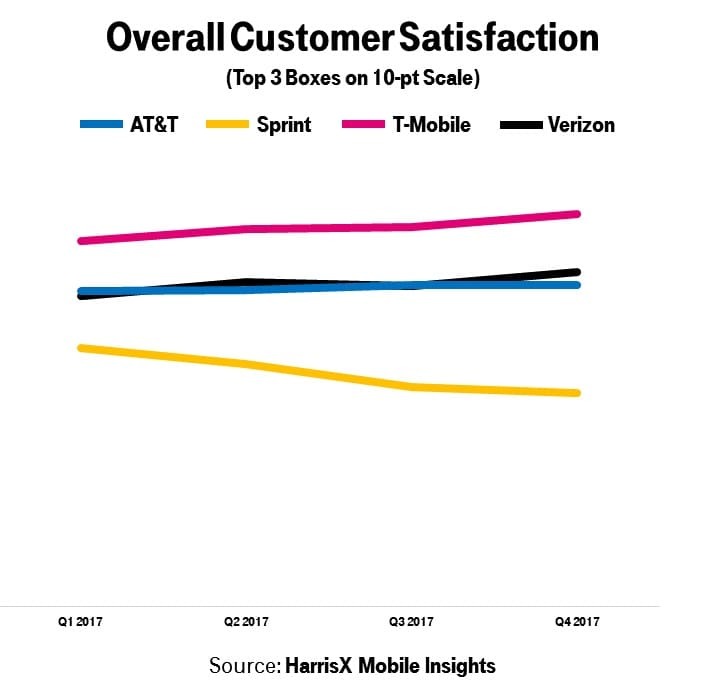 Based on HarrisX Mobile Insights survey data using subscriber’s self-reported rating of Overall Satisfaction on a scale from 1 (Least Satisfied) to 10 (Most Satisfied). Likelihood to Recommend is on a scale from 0 (Extremely Unlikely) to 10 (Extremely Likely). Underlying source data is estimation based on national survey of 90,000 quarterly mobile phone users, Jan through Dec 2017. YouGov BrandIndex data is based on daily polls conducted between January – December 2017 involving a nationally representative sample of more than 35,000 US consumers and each respondent’s self-reported net perceptions (% positive - % negative). Satisfaction is calculated by taking the percentage of satisfied customers and subtracting it by the percentage of dissatisfied customers. Satisfaction is based on a 3-point scale (positive/negative/neutral). Data from Speedtest Intelligence based on average 4G LTE speeds. Q1 2014 through Q2 2017 is T-Mobile’s analysis of the data. Q3 – Q4 2017 is Ookla’s analysis of the data. Capable device required for Extended Range LTE. 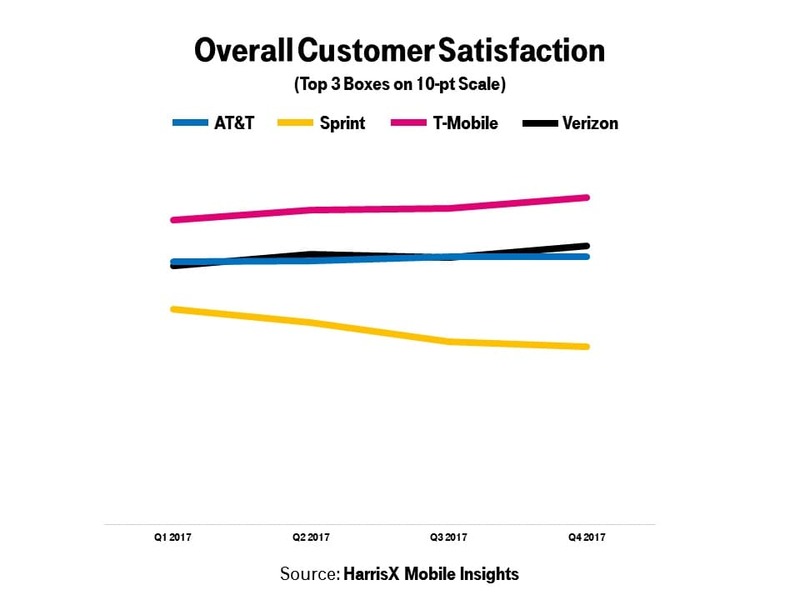 Overall Customer Satisfaction - HarrisX Mobile Insights. Link to view and download the asset in the Media Library. 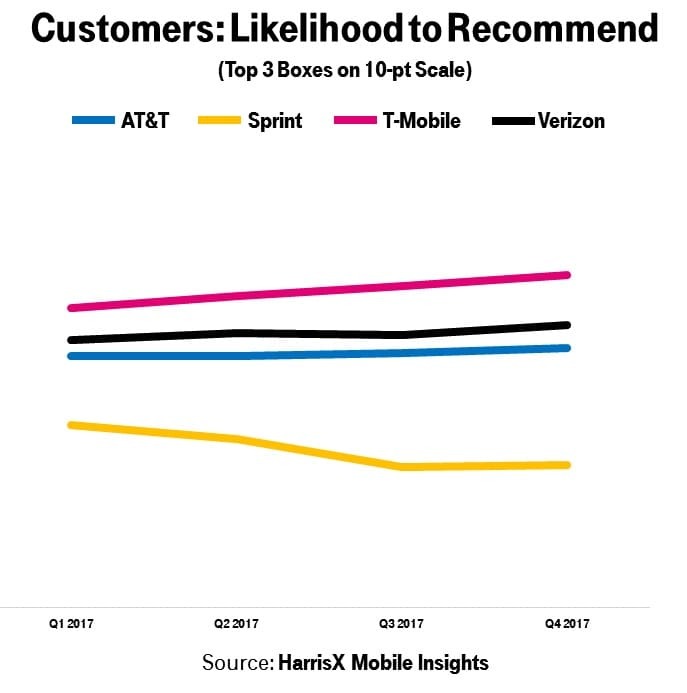 Likelihood to Recommend - HarrisX Mobile Insights. Link to view and download the asset in the Media Library. Overall Customer Satisfaction - YouGov Brand Index. Link to view and download the asset in the Media Library.